Nancy Drew and the Hidden Staircase is a 2019 American teen mystery film directed by Katt Shea with a screenplay by Nina Fiore and John Herrera, based on the book of the same name by Carolyn Keene which was earlier adapted for a 1939 film. 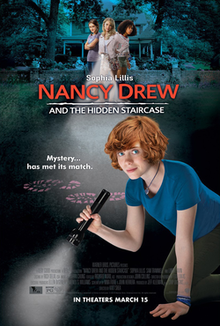 The film stars Sophia Lillis in the titular role of Nancy Drew, as she investigates a haunted house. After her mother's death, 16-year-old sleuth Nancy Drew and her father Carson relocate from Chicago to rural River Heights. Following a number of incidents, including an online prank on a jock after he humiliates one of Nancy's friends, Nancy is sentenced to community service. Nancy soon comes to the aid of Flora, an elderly woman needing help with a supernatural presence in her home. Nancy sleeps overnight at Flora's home along with Flora's niece Helen Corning, who is Nancy's arch rival. That night, strange things begin to happen, with things floating and coming to life, cabinet doors and drawers opening, and a cloaked figure appearing and warning Nancy to give up her mystery. The next day, Nancy believes that someone broke in and tried scaring them out. Nancy and Helen investigate, and they find a secret passage that leads to the staircase, confirming Nancy's suspicion. Nancy, Helen, George and Bess break into the school's lab, but Nancy ends up getting in trouble again and her Aunt Hannah grounds her. Nancy then tries calling Carson, but instead receives a call from Nate, who tells her that Carson was spending the night at the hotel. Worried that something has happened to him, Nancy and Helen head to the hotel, but Carson isn't there. They check the security footage from the previous night and see Carson being ambushed and kidnapped by the driver. Nancy discovers the vehicle belongs to Willie Wharton, the man who almost ran her over. Nancy and Helen head back home to save Carson. On the way, she calls Deputy Patrick to help, but when he arrives at the house, he is knocked out by Nate, who takes his gun. On April 20, 2018, it was reported that Sophia Lillis would star in the film adaptation of Nancy Drew and the Hidden Staircase, which would be produced by Ellen DeGeneres, Jeff Kleeman, and Chip Diggins for Warner Bros. Pictures. In June 2018, other cast was announced which included Zoe Renee as George, Mackenzie Graham as Bess, Laura Slade Wiggins as Helen, Sam Trammell as Carson, Linda Lavin as Flora, and Andrea Anders as Hannah, along with Jay DeVon Johnson, Andrew Matthew Welch, Jon Briddell, Josh Daugherty, Evan Castelloe, and Jesse C. Boyd. Principal photography on the film took place in June 2018 in Monroe, Georgia. On January 18, 2019, DeGeneres announced exclusively that the film would be released in theaters on March 15; she also debuted a trailer. On February 19, 2019 Warner Bros. Pictures released a short clip from the movie. The score of movie was composed by Sherri Chung. Emily Bear composed and sings the songs "More than Just a Girl" and "Daylight". On the review aggregator Rotten Tomatoes, the film holds an approval rating of 64% based on 22 reviews, with a weighted average of 5.75/10. On Metacritic, the film has a score of 55 out of 100 based on 10 critics, indicating "mixed or average reviews". ^ a b Gurung, Regina (November 28, 2018). "'Nancy Drew and the Hidden Staircase': Sophia Lillis stars as teen detective highlighting 'female brain power'". MEAWW. Retrieved January 1, 2019. ^ "Nancy Drew and the Hidden Staircase". AMC Theatres. Retrieved March 5, 2019. ^ a b Parlevliet, Mirko (January 18, 2019). "Nancy Drew and the Hidden Staircase Trailer Featuring Sophia Lillis". Vital Thrills. Retrieved January 18, 2019. ^ a b Evangelista, Chris (January 18, 2019). "'Nancy Drew and the Hidden Staircase' Trailer: 'It' Star Sophia Lillis Becomes the Teen Detective". Slash Film. Retrieved January 18, 2019. ^ a b Franklin, Garth (January 18, 2019). ""Nancy Drew and the Hidden Staircase"". Dark Horizons. Retrieved January 18, 2019. ^ N'Duka, Amanda (April 20, 2018). "'It' Star Sophia Lillis To Topline Warner Bros' 'Nancy Drew And The Hidden Staircase'". Deadline. Retrieved April 21, 2018. ^ a b Hemmert, Kylie (June 6, 2018). "First Look at New Nancy Drew Movie as Production Begins". ComingSoon.net. Retrieved June 7, 2018. ^ Furdyk, Brent. "First Look At New Clip From 'Nancy Drew And The Hidden Staircase'". ET Canada. Retrieved February 19, 2019. ^ Harris, Shannon (March 11, 2019). "Emily Bear's music to be heard in new Nancy Drew movie". Wifr23.com. Retrieved March 15, 2019. ^ "Nancy Drew and the Hidden Staircase (2019)". Rotten Tomatoes. Fandango. Retrieved March 21, 2019. ^ "Nancy Drew and the Hidden Staircase". www.metacritic.com. Metacritic. Retrieved 21 March 2019.